Have you ever paused to wonder where the feather that lies in your path comes from? Have you ever discovered a small bird nest among the backyard bramble? Once a year, John James Audubon State Park is a part of a festival that’s not just for the birds. On April 21-23, the celebration of the Ohio Valley Birding Festival takes place on and around Audubon State Park stomping grounds. There are so many outdoor and educational festivities going on during this weekend, we are going to give you some highlights so you can make the most of your Birding Festival experience. Click on each event for more details. Participation of all ages is encouraged! 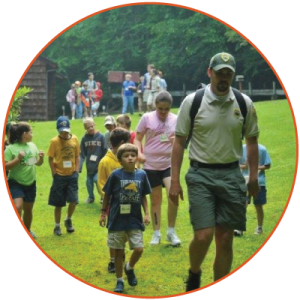 Venture through a Beech-Maple forest and discover an urban oasis of bird species similar to what inspired John James Audubon Great for preteens and adults interested in birding and hiking. Starts at 8:30 a.m. Saturday April, 22. Duration is approximately 1.5 hours. Cost is free, no pre-registration required. Examine feathers, how to identify birds, and binocular skills Great for ages 8-adult interested in hiking and learning. Starts at 11:30 a.m. Sunday, April 23. Duration approximately 1 hour. Cost is free, no pre-registration required. 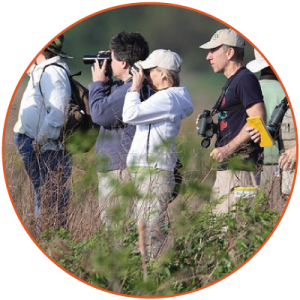 Join junior birders and Audubon Society members for a binocular hike. Great for kids age 8-18, must be accompanied by an adult. Starts at 2:00 p.m. Sunday, April 23. Duration 1-2 hours. Cost is free, no pre-registration required. Presented by Sharon Sorenson – learn to recognize about a dozen varities of colorful birds, and discover how far they’ve traveled to visit us in the Tri-State. Great for kids and adults with interests in birds and learning. Starts at 1:00 p.m. Saturday, April 22. Duration approximately 1 hour. Cost is free, no pre-registration required. Looking for a chance to entertain the kids on a flexible schedule? Arrive any time between 10:00 a.m.-1:00 p.m. on Saturday, April 22, to take part in any of these family fun sessions. Cost is free, no pre-registration required. Help out your fine-feathered friends with a simple bird feeder you make yourself. We’ll show you how! Does it always seem like the birds are too far away to see clearly? 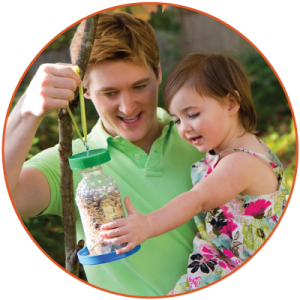 Make a bird caller and those little birds may come closer to investigate your “twittering” sounds. A fun way to try some bird watching! You become a bird when you join in this GIANT board game! Migration is a risky business for bird species who journey yearly from wintering grounds to breeding grounds, sometimes traveling thousands of miles. What hazards might you find along the way? Will you be the bird that survives? Come take the challenge! Hands-on Activities You Don’t Miss! Can’t go to all the events but want to catch some highlights? Put these interactive sessions on your calendar, and be sure to bring a camera! Interactive experience with live raptor birds! Presented by The Talon Trust. Great for all ages wanting to get up close to wildlife. Starts 11:30 a.m. Saturday, April 22. Duration is approximately 1 hour. Cost is free, no pre-registration required. 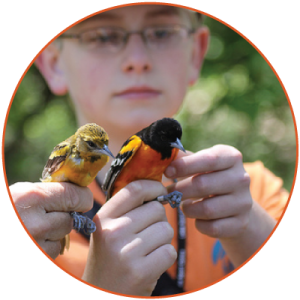 Catch, band and release migrating birds and learn about bird populations and behaviors. Great for kids and adults interested in hands-on learning. Starts at 12:30 p.m. Sunday April, 23. Duration is approximately 1.5 hours. Cost is free, no pre-registration required. Owl Puke – Yuck! Or Not? The thought of owl puke may seem disgusting, but wait until you see what’s inside that lump! Discover what critters the owls consider a tasty dinner, when you dissect a sterilized owl pellet. You just may be amazed at what you find! Starts at 10:30 a.m. Saturday, April 22. Duration is approximately 1 hour. Cost is free, no pre-registration required. Explore the newly acquired Audubon State Park property and identify this bottom-land forest’s bird guests. Active bald eagle nest and heron rookery on site. Participants should be experienced bird watchers. Starts at 7:00 a.m. Saturday, April 22. Duration is approximately 2 hours. Pre-registration is required for the event, the cost is free. Registration ends April 19th. Join us for a birding walk through this 127-acre urban wetland area. Species observed on this hike may include: Wood Duck, Winter Wren, warblers, vireos, thrushes, migratory songbirds, tanagers and late shorebirds. Great for experienced hikers or birders. Starts at 7:00 a.m. Sunday, April 23. Duration is approximately 2 hours. Cost is free, no pre-registration required. For a complete list of Henderson events, visit our Community Calendar!